How often do people from Google, NASA, XPrize and others like those visit Estonia, or even the Nordics? Let’s make sure they want to return! Robotex International Conference is a spin off event of Robotex International, which takes place in Tallinn Creative Hub through 30. November - 1. December, 2018. It’s the first of its kind conference happening in Europe, only focusing on the Frontier Technology topics, from Data Science and Conversational AI to Cyber Security and Space Tech. Meant for the Corporates, Investors, Policymakers and Startup founders that want to learn more about the future technologies and prepare themselves for the changes that are coming. With NO time spent on the general topics, such as 101 of Fundraising, Hiring or Marketing! Instead, giving the kickstart to the Nordics and the Baltics startups so they would turn their attention to the technologies that will actually change the course of humanity within the next few decades. The tickets are on sale now. What will happen at the Most Epic Frontier Tech Executive Gathering? Over 90% of our speakers will join us from countries outside of the Nordics and the Baltics, such as Australia, Brazil, China, France, Germany, Ghana, Ireland, Israel, Italy, Japan, Luxembourg, New Zealand, Nigeria, Portugal, Singapore, Spain, the Netherlands, the United Kingdom and the United States. Moreover, we will bring together executives from companies like ADDO AI, Akash Systems, Asgard.VC, Atos, Canonical Robots, Cleveron, Code.org, Cyborg Nest, DAIN Studios, Draper Dark Flow, Drone Industry Insights, ESA, ETER9, Expon Capital, Fedger.io, FollowTheSeed, Ghana Tech Summit, Google, Government of Brazil, Guaana, Hacking House, Lightneer, Local Motors, Makeblock, Mindtitan, Mistletoe, Moonshot, Museum of Awe, NASA, NewSpace, Pirate.Global, qCrypt, Scythe, SpaceBase, Starship, Taxify, Toyota AI Ventures, University of Naples Federico II, X.AI, Xprize, Yes.com. This includes our opening keynote by Cassie Kozyrkov - Chief Decision Scientist at Google, who will also host a workshop on Building data-driven cultures in global organizations. It doesn’t happen often that Chief-level Google employees come to this region so please do prepare your questions already beforehand, as there will be plenty of chance to get them answered. The first day will also include the product launch of Cleveron’s new product that will revolutionise the way packages are sent and delivered. Meanwhile, executives from other top logistics and autonomous vehicle startups will share what will be the next innovations in the mobility space. After that, we’ll have Cyber Security experts such as Bryson Bort, Guy Philippe Goldstein and Koen Maris talk about the ways for fighting the threats of tomorrow. Followed by some of the coolest Industry 4.0 innovators talking about the future of manufacturing. And the first day at big ideas stage ends with Liviu Babitz talking to us about “Hacking your brain to get an extra sense, becoming a cyborg”. The second day will start with keynotes on “Imagination, Desire and the Call of the Future” by David Delgado - Visual Strategist at NASA Jet Propulsion Laboratory and “Hack-My-Sat: cyber-threats and the digital revolution in space” by Luca del Monte - Head of Industrial Policy and SME Division at ESA. If there’s any questions one might have regarding space then this is your chance to get them answered by those two guys. Later we’ll have a few other Space Tech company executives talk about taking humans to space, as well as bringing innovation down from there with speakers like Emeline Paat-Dahlstrom, Troy McCann and Jeanette Quinlan. We’ll also host a workshop with ESA through the day to discuss for ways how to generate more cooperation with Space Tech and non-Space Tech companies. Afterwards, the stages will be taken over by talks on education of the next tech founders and bringing more women into tech. This will include showing some of the top new methodologies and solutions used in education, as well as female founders of top data science startups showing what they have been able to build, and where they will go on in the future. The conference ends with tips on automating our lives by using various bots and AI-based social platforms that will assist us in the online world by controlling the flow there. Meanwhile, the other stages will include various clinics, fireside chats, panel discussions and workshops in similar fields, as well as pitching sessions by early-stage startups around the region. And of course networking and 1-on-1 meetings. We’ll also host a bunch of side events, such as an active Investor Day, the Opening Ceremony with all sorts of fun, various inbetween sessions to humanise robotics at the conference, Cyber Security and Data Science meetups for the more technical minds and two awesome parties at the end of the conference days. VIPs will also be able to join us for the speaker dinners, spending even more time with the awesome international executives. 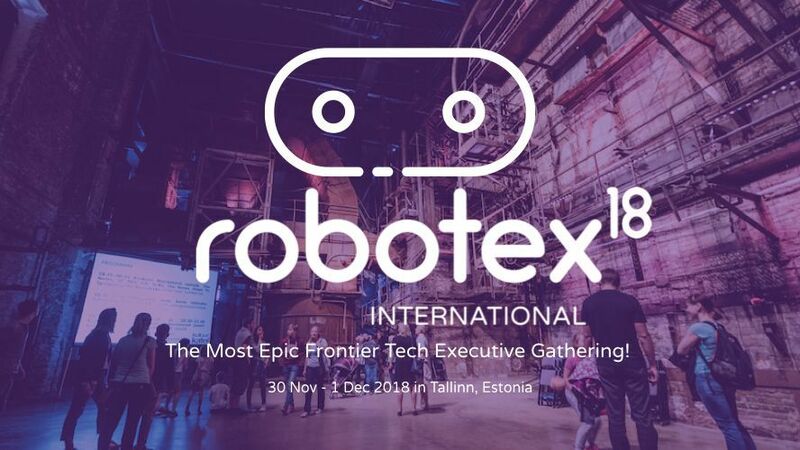 Other than that, Robotex International festival at Estonian Fair Centre will feature an exhibition with the most advanced frontier tech solutions for both B2C and B2B markets, as well as various service providers giving great discounts to their services. That’s where we’ll also have the future engineering talent competing at various robotics and AI challenges, showing their skills and altogether bringing together over 30’000 people. How can you join the conference? The tickets are on sale now. Grab yours before the prices increase on October 15. Until then, startups (raised/revenue less than 1’000’000) get their pass for €99, while others get the general pass for €299. In both cases, you’ll be welcome to our conference and the festival, including all the meetups, parties and other side activities. Investors that want some extra perks, such as access to Investor Day, Lists of Startups Pitching and Investor Lounge get their pass for €399. And if that’s not enough, then we also sell VIP passes for €599, giving extra access to speaker dinners and speaker lounge. So see you in Tallinn! This is a guest post by Sander Gansen, Chairman of the Board of Robotex.